In an interview, the famous French Director Eric Rohmer said - “You can say that my work is closer to the novel - to a certain classic style of novel which the cinema is now taking over - than to other forms of entertainment, like the theatre.” Rohmer wanted to look at “thoughts rather than actions”, dealing “less with what people do than what is going on in their minds while they are doing it.” We can confidently state that his film My Night at Maud's epitomizes this philosophy. Eric Rohmer's My Night at Maud's is an accomplished centerpiece of Rohmer’s “Six Moral Tales” series. Each in this series is a variation on a single situation: a man who is in love with one woman meets and spends some time with another woman, whom he finds supremely attractive, but with whom he does not consummate the affair. Each examines the philosophical and moral conundrums surrounding love and contemporary life. Chance and fate, and the present and the past, are the themes of this black-and-white classic. Elegance and eloquence may seem like strange words to use about this film that was photographed entirely in black and white in a French provincial city in the dreariness of winter (mostly in ordinary interior settings) and that concerns four seemingly commonplace people, none of whom renounces a throne or even possesses an inflammatory political ideology. The hero of My Night at Maud’s is Jean-Louis (Jean-Louis Trintignant), an engineer in his early 30's, a solitary but not a lonely sort, a man who at first seems to be something of a prig. He isn't. He just values himself too much—in the best sense—to waste time on superficial sexual or social experiments. Within his abiding Roman Catholicism, he also believes that he will ultimately meet and marry the right girl, who will not only be Catholic but also blonde. The film opens as Jean-Louis (Jean-Louis Trintignant), an engineer for Michelin who has recently been transferred to the French provinces, drives from his house to a cathedral in Clermont-Ferrand to attend a Christmas Eve mass. During his devotions he notices a blonde woman (Marie-Christine Barrault), but does not approach her. After church he runs into a friend, Vidal (Antoine Vitez), from his high school days and has a meal with him. Afterwards, Vidal mentions that he wants to visit his friend Maud, a recently divorced mother and pediatrician seductively played by Françoise Fabian. 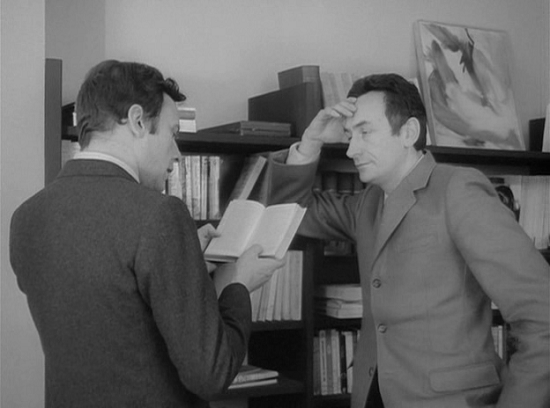 Vidal, obviously enamored of Maud, encourages Jean-Louis to spend the night with her. Jean-Louis resists, but decides to stay. Perhaps Vidal wants an excuse to hate her, or maybe he is testing her. It is one of the many questions about love that the film poses. During dinner with Maud and Vidal, Jean-Louis claims not to be interested in casual affairs anymore, professing a strong Catholic faith and the desire to settle down and marry. Jean-Louis, who recently began rereading the writings of Blaise Pascal, relates his situation to the 17th century philosopher’s famous wager that it was logical to believe in God, because if “he” does not exist, you lose very little by believing and gain everything if he does. From a religious point of view the wager is unsatisfying, because it does not require true faith; it’s simply playing the odds. Pascal was a Jansenist, a sect of French Catholicism that believed that salvation can only be achieved through God’s grace that is predestined, regardless of our actions. In opposition to the Jansenists, the Jesuits advocated actively pursuing a virtuous life to enable entry into heaven. 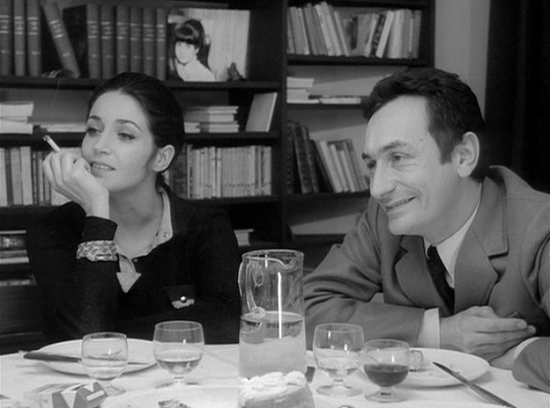 Jean-Louis likes to think of himself as following the Jesuit path, but Rohmer’s scenario at Maud’s is designed to see if this is true. Maud (Francoise Fabian), who is beautiful and wise, tells Jean about her marriage, her dead lover, her husband's mistress (a lovely young Catholic girl) and tries unsuccessfully to seduce him. The very next day, Jean-Louis meets the girl for whom he has been looking—which is not quite the end of a tale that is as ironic as it is moral. Rohmer's achievement in My Night at Maud’s is that he has been able to make so much talk so unaffectedly cinematic. Most refreshing is the sight and sound of four characters who are articulate, interested, informed, educated, amused, vulnerable, totally free of epigrams and aware of their identities. Their only concern is the manner in which they will realize those identities, and whether it will be by choice, predestination or simple luck. The film is beautifully played, that is, as written, which is almost as if it were music. The camera literally and figuratively never looks down or up at the characters. It faces them straight on, the better to catch some completely unexpected moments of intimacy and humor. A series of "Hundred Favorite Films Forever"